Sea trout fishing down south was poor this year compared to last year, although we did manage to bring home some beautiful sea trout, flounder and whiting fillets. Most days we got up at 5 am, hurried through breakfast and were at the Gulf shore with the live shrimp bait ready to catch some fish. Why did we have to get up so early? Well, you see, parking was at a premium so it was the early fisherman that got the good parking spots. It wasn’t just the fisherman who took up the parking spaces. No! It was the dedicated shark teeth hunters who came by the dozens looking to find those little black shark teeth. There were days, even weeks at a time when my Honey didn’t have a nibble. Not even a tiny one. He didn’t give up. Defeat is not in his vocabulary. Finally, the day came when he got that huge tug. He knew what that meant. He had something on the line. It was a sea trout! The very one we’re fixing for dinner. He put up quite a fight before my Hubby could reel him in. Mr. Sea Trout measured 21 inches and weighed around 3 to 4 pounds. It really helps to preserve the fish and prevents the fillets from getting freezer burned. We do this even when we purchase seafood from the grocery store. The quart-size bags are perfect meal- size portions. When we’re ready for a fish meal, we thaw one of the Zip-Lock bags in the refrigerator. Spicy Baked Sea Trout in Lemon Butter Sauce is the recipe we decide on for beautiful fillets. Before we’re ready to bake the fillets, we feel through the flesh to make sure that there aren’t any small bones still remaining. We pat the fillets with paper towels to absorb some of the moisture. Now we are ready to proceed with the recipe. 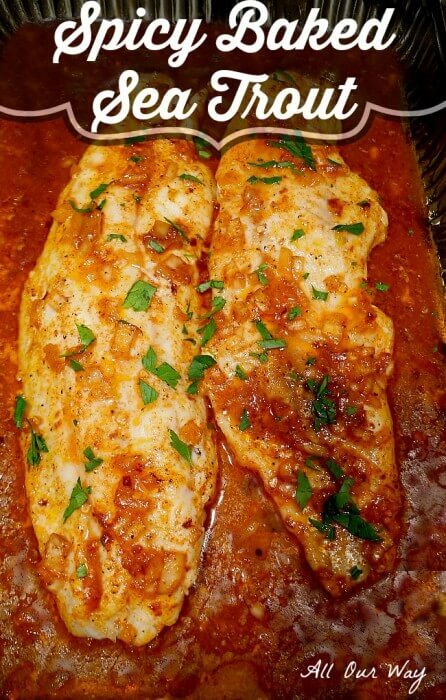 This recipe is very easy and works well with any firm fleshed fish such as flounder, whiting, sole, sea bass or tilapia. The ingredients are basic: fresh lemon juice, unsalted butter, onion, salt, black pepper, red pepper flakes, paprika, and capers are optional. We serve our Spicy Baked Sea Trout in Lemon Butter Sauce with Herbed Lemon and Spinach Quinoa — that will be the next post. Note: Recipes and content from All Our Way ©2015 are copyright protected. Please do not use content or recipe without prior written permission. If you want to share the information, please link to this post. Grazie. Spicy Baked Sea Trout with Lemon Sauce is an easy recipe that tastes rich and complicated. The lemon butter sauce gets the spice from the hot red peppers and the rich red color from the paprika. Can substitute other firm fleshed fish such as sole, whiting, flounder, sea bass. Butter a glass casserole -large enough so that the fillets aren't crowded. Lay the fillets in a single layer in the glass casserole. Whisk the melted butter, lemon juice, minced onion, salt, paprika, red pepper flakes, black pepper until well blended. (Also add the capers if you wish.) Pour the sauce evenly over the fillets. Bake in the heated oven for 20 to 25 minutes. The fillets will be firm but still moist. Serve immediately and spoon some additional sauce over the fillets. We served our fish with herbed lemon and spinach quinoa. Trout and salmon are both my favorites. Salmon used to be my favorite but with this recipe now trout is my favorite of the two. Enjoyed recipe. I did not use capers and substituted chipotle pepper for the black pepper. I was out of lemon juice and so used lime juice instead. Will fix recipe again. Tried it tonight with fresh Trout we caught yesterday and it was awesome – thanks!! Coming from South Texas I have to admit it wasn’t spicy, great flavor but not too spicy. However everyone’s tastebuds are not the same…. Hi, Bill!! Thanks for commenting. And you’re right — I put spicy because some people think a little pepper is spicy. We always add an extra dash or two. By the way, if you enjoy spicy, try making our Light My Fire Habanero Sauce. It is soooo good and it’s very easy to make. Happy Cooking!!! I’m so impressed that your hubby caught your dinner! I love fish, but I’ve never been fishing. I’d need your help to deal with a whole fish!!! I’ll confess: I’ve never gone fishing because I’ve never been able to wake up early enough!! I love using the lemon to cut through the spice in this recipe. Such a great combo together. I have not gone fishing in long time and I don’t think I have ever catch something worth eating but I can definitely make this sauce with fish I get at the market. That spicy butter sounds so delicious yet simple to make! This sounds refreshing, simple, and just downright lovely. I love how versatile white fish is and how if you stumble upon a recipe using a certain type, you can easily sub-in a different one if more convenient. This is also fab because you can pair it with pretty much any side! Love the simple, classic flavors in this wonderful dish! We eat seafood at least once a week and I would love to try this (although probably on halibut since I don’t know that I can get sea trout in my area). What a lovely fish and it couldn’t get fresher! High five to your husband for being so persistent. And the spices you added to the fish look great. Yum! What a great catch, I’m so impressed! I’ve tried fishing with friends a few times and I’ve never been able to catch anything we’ve actually been able to cook. 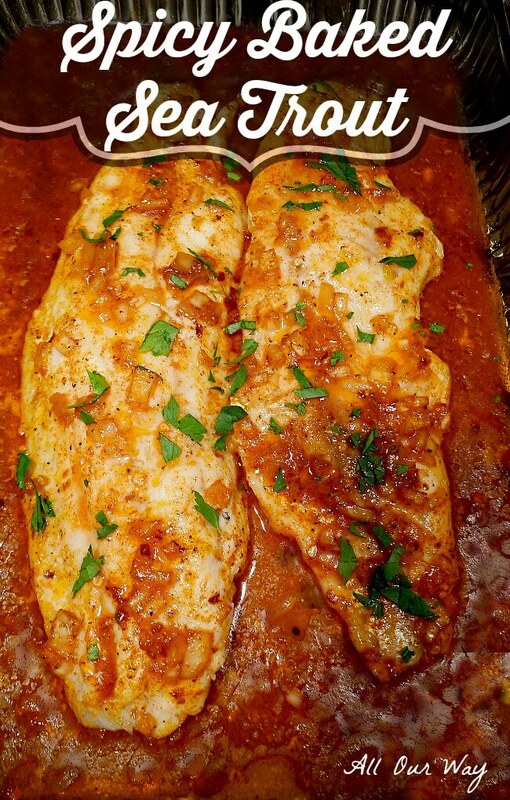 🙂 This recipe looks like the perfect way to prepare these special fillets. Love the flavors and color of the sauce and that gorgeous fish could not possibly get fresher! I do not cook fish often enough, but this recipe is making me want to make some! I’m sure fresh caught fish is the absolute best! I love anything spicy and I think capers on top would make this amazing! When I was a kid…my dad and uncles LOVED to go fishing. I remember my mom cleaning the fish….and I thought it was “yucky”. Guess that is why I BUY fish LOL. There is a market in the city that has so many kinds…and I let them do all the hard work cleaning and scaling. This recipe sounds delicious….and we love spice so I know we would love it just the way you have made it here. Hi, Mario! Thanks for the tip — you can never go wrong with Panko crumbs.😋 In fact, we are Panko fiends and just bought a humongous bag. Next recipe coming out is shrimp with toasty Panko crumbs. Thank you, Veronika! It really is very tasty!! Hi, Tatiana! If your family likes seafood they’ll love the sea trout recipe. This sounds so flavorful, I’m going to try this soon. I used to live near the coast and miss those seriously fresh catches. Love it! Thank you Stacey. It’s such an easy way to make fish and the taste is divine. My husband is not a fan of fish, so whenever he’s working late or out of town I always treat myself to some fish without worry about stinking up the apartment. This will have to go on the list. I’m a big fan of rainbow trout, but I don’t think I’ve ever tried sea trout. Sounds like a must! Hi, Lauren! You may want to give Hubby a taste. It really is mild and does not have a heavy fish smell. The taste is one guys really go for. I love spicy sauces with fish! I think a lot of white fish can be pretty bland, so the blank palate is PERFECT for lots of hearty spices. So neat that you catch and clean the fish yourself! Hello, Julie!! Fresh fish is so good! There are lots of great recipes that only enhances the delicious flavor. Thank you for commenting. I don’t think I’ve ever done a *spicy* lemon butter sauce on fish before – I’ll have to give it a shot! I think that butter sauce is one of the best ways to make fish. This looks lovely. I’m usually more of a seafood person but this looks like a delicious way to prepare trout that could change my mind! I loved reading your post – it make s me want to get out on the high seas! 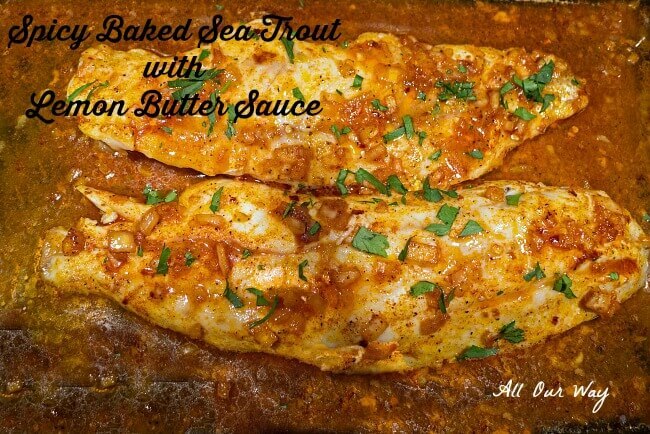 Trout is one of those fish that I love but I don’t have it enough, I love the marinade with this. Oh wow! I’ve never been fishing, but I’m so jealous of your fresh trout! It’s hard to find good trout here. YUM! Hi, Sarah! Right now the sea trout are being pretty elusive. Hopefully they’ll make a showing because that is one of our favorite fish. Have a great day!! I love fresh seafood — and we live about a mile from the Atlantic, so it’s readily available and I’m always looking for new preparations. This sounds delicious. Lisa, you’ll love this easy recipe. If you have a fisherman in the family and they get a sea trout — it’s tasty. But seriously it’s tasty with any firm-fleshed fish. Merry Christmas! That’s a great idea, Deanna! Merry Christmas! I love trout, such an under used fish, I think. This looks delicious. Thank you, Debi!! It is a delicious recipe. Works with any firm flesh fish. This looks and sounds amazing! I love the ingredients used. So much flavor! Thank you, Brandi. For such an easy recipe it is loaded with taste! What a great recipe and I love the back story! Hello, Lori! The spicy lemon butter really makes the fish delicious. I hope you give it a try. So delicious sounding. 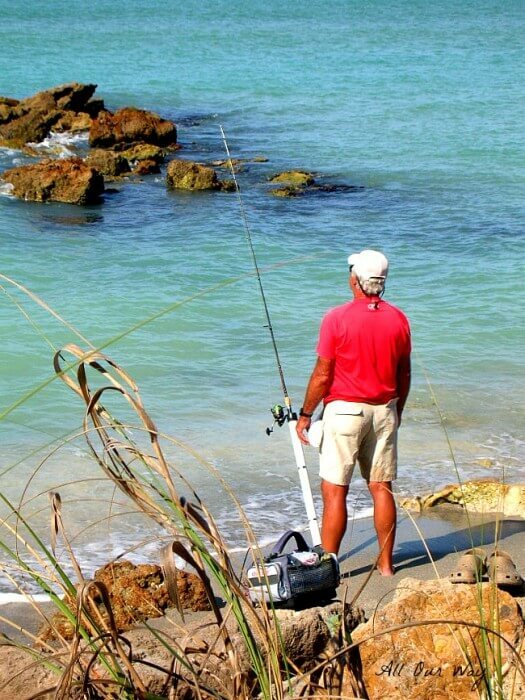 Here’s hoping that we will live close enough to the ocean one day to go fishing frequently! Your recipes are enticing! Thank you for sharing at the #BloggingGrandmothersLinkParty! Pinned and shared. I can’t wait to try this Marisa! Thanks for sharing at #BloggingGrandmothersLinkParty and I’ve pinned and shared on social media. Thank you for commenting, Sue! And I certainly appreciate you sharing. Have a nice day. Yum, I can just smell it, I know it’s tasty 🙂 Thank you for linking up at the #BloggingGrandmothersLinkParty. I shared your post on Facebook, Google+, Pinterest, and Twitter. Hi, Dee! Thank you for sharing the Link Party. 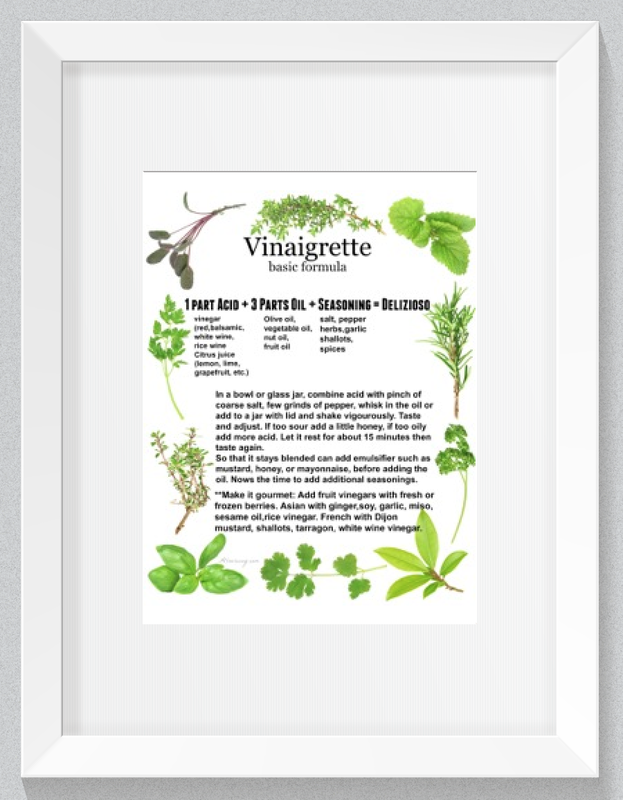 It’s a wonderful way for us to share our recipes. And thank you for sharing with your social media. Yummy:) Enjoyed this wonderful recipe. I had shallots so I used that instead of onion. I will make this again! Thank you. This is the definition of fresh fish! This is totally my kind of dish, easy, flavorful and simple ingredients. I love fish with lemon flavor and the use of capers+peppers would just highlight the flavors even more. Thank you, Molly! For being a simple dish it is rich in flavor! It’s so awesome that you live so close to the location where you can catch all of these fish fresh! Every now and again I will buy rainbow trout, but would love to be able to catch all of these varieties myself!! Looks like early bird gets the best parking space should be your new motto! Lol!! We are lucky when the fish are biting! Sometimes it is just a very long day. For me, not for hubby – he loves fishing. I like the idea of your motto, Dene’! ? Oh Marisa you killing me with all these amazing fish recipes recently – I love fish but I have to reply on frozen and that too is not so affordable.. Can’t wait to this some of these soon… with my frozen fish of course. That’s okay, Veena! 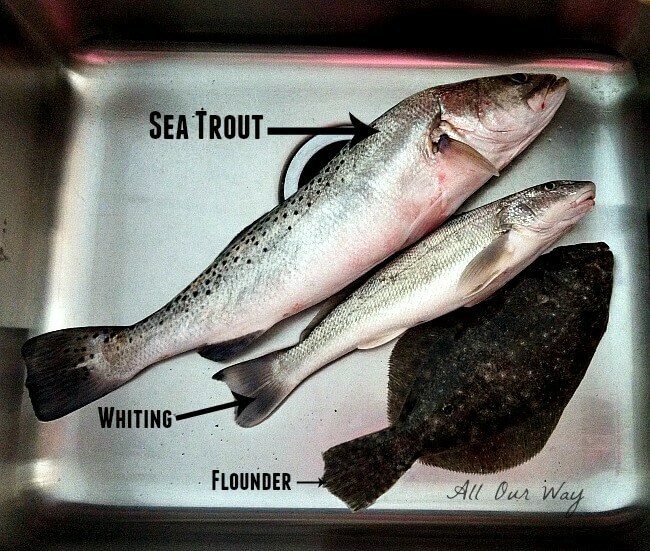 When fishing is slow we’ve had to rely on what the fishmonger has or what’s in the freezer. The recipe will be good with the thawed out fillets. Have a great day! I’ve never had sea trout or even seen it! Would the recipe work with freshwater trout as well? Hi, Sarah! We’ve never tried it with the freshwater trout but I don’t see why it wouldn’t work. If you do make it, please let me know how it turns out. Love trout! This looks delicious and I know my husband would love it, too. Might need to make this for dinner soon! Hi, Christine! Everyone in our family loves the recipe, especially the males (they love spicy). Have a great day! How I wish I lived by the sea… A wonderful story to go with a delicious dish! I may use your preparation on fish I can find in my area, it looks wonderful! I know how you feel, Jodi! We go to the sea several months out of the year. Not only is it relaxing but Hubby does like to fish. Hi, Adriana! This recipe will be great with any firm fish fillet. The sauce really adds to the flavor. The hubs and I are headed to Destin this weekend and every year he goes deep sea fishing with the guys in his family. For a good few weeks, we eat and we are always looking for a new recipe to try. This sounds amazing! Lucky you, Jessica!! We haven’t been to the Destin area but hear the beaches are gorgeous and the fishing is fantastic. If you try the recipe let me know the fish you used it on and if you liked it. There’s nothing like an early morning by the water! And what a great reward, when you can bring home supper too! I know, Noel! The early morning sacrifice is well worth it when you see a beautiful sunrise and you get dinner. ? My son went out fishing today and caught a sea trout. We were suppose to go out to dinner for his birthday, but instead he wanted to cook his fish. To my amazement your recipe is the first one I clicked on and low and behold you were talking about Caspersen beach and we live in Venice! We cooked up the fish using your recipe and loved it! Thank you for sharing! Hello, Nancy! How wonderful it is to meet another person in Venice. We’ve been coming here for years — snowbirds. Your son is very lucky to have caught anything what with the red tide. My poor Honey has been out three times in almost 8 weeks and not much to show for it. He’s not a happy camper. Happy birthday to your son and congratulations on catching the sea trout. Amazong! It didnt look like much but the flavours!!! Wow wow!! Marisa I made your recipe last night with local caught gulf flounder and it was outstanding. Thank you for sharing this recipe with your readers. It will be a regular in my recipe collection. Oh Marisa! Your recipe sounds amazing!! I love the idea of using lemon and red pepper flakes for heat. YUM!! 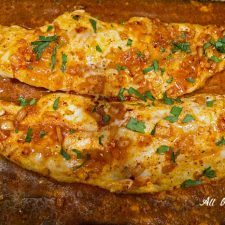 My husband and I enjoy fish often, and I’m always looking for new recipes. I am sure you and your hubby will really enjoy the recipe. Nice part is that you can use other types of fish — and I hope your week is going great! Buona Giornata. This recipe sounds wonderful. How great that you live so close to waters that hold those delicious fish – and that your husband doesn’t give up on his tries. I love your recipe. I can sometimes get pompano at a much higher price than our local flounder. I’ll have to see if my fish market has trout so I can make this delicious recipe. We really like it and it is so easy. If you don’t like it too spicy just cut back on the red pepper. Flounder would work great in this recipe. 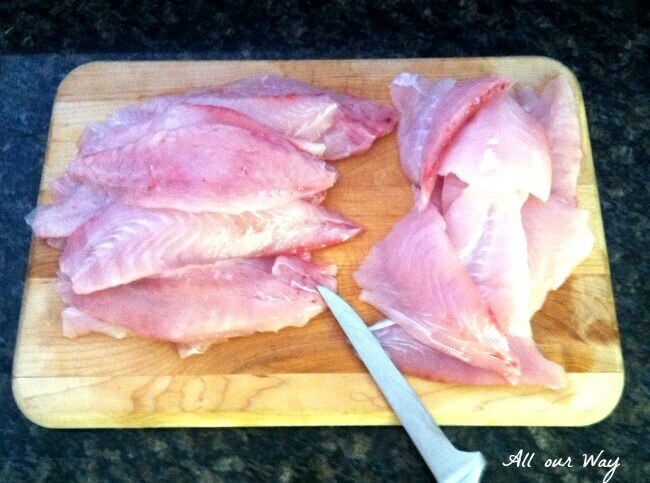 My hubby loves to catch flounder and we really like the taste.